20 x Green-veined White, 5 x Speckled Wood. Sunny and hot all day. 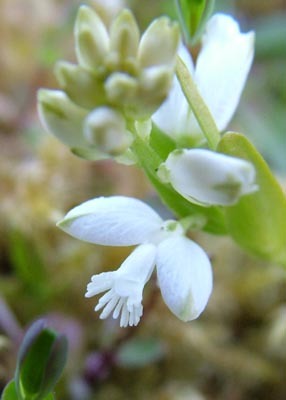 In a clearing in the forestry, all kinds of odd things appear: This is the all-white version of the Heath Milkwort. This would make a great quiz picture. So that's what I'll do. What do you think it is? This metallic green Weevil wandered over my hand for a while. Looks like Polydrusus pulchellus. About 8mm long.